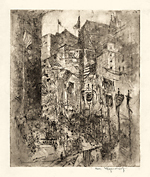 Armistice Day - 1918, Etching with Watercolor. Edition not stated. Signed in pencil. Signed and dated in the plate, lower left. Image size 9 3/4 x 8 inches (248 x 203 mm); sheet size 12 3/8 x 9 1/2 inches (314 x 241 mm). 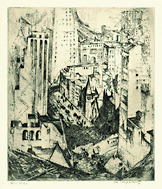 A unique impression with the artist's watercolor additions throughout, on off-white wove paper, with full margins (5/8 to 1 3/8 inches), in excellent condition. 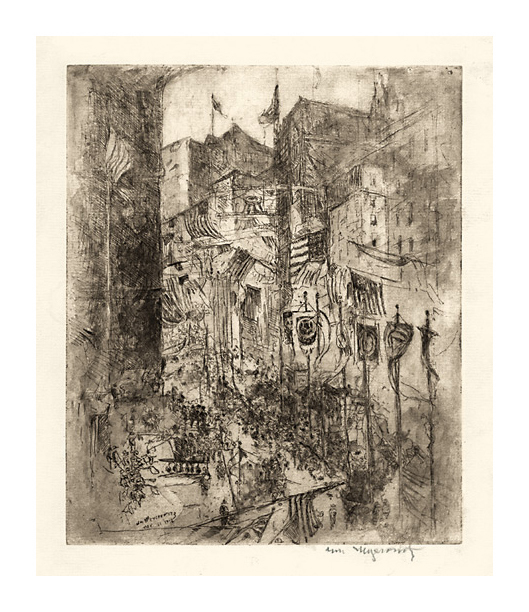 Early Morning Gloucester - 1923, Etching. Edition 100. Signed, titled and numbered 63/100 in pencil. Signed and dated in the plate, lower right. Image size 7 7/8 x 11 3/4 inches (200 x 298 mm); sheet size 9 3/4 x 13 1/2 inches (248 x 343 mm). A fine, luminous impression with delicate plate tone, on cream wove paper. Full margins (7/8 inch), the artist's tack holes along the sheet edge, in excellent condition. 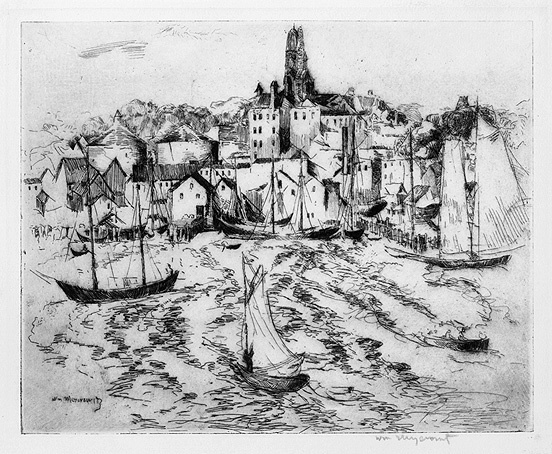 Untitled (Gloucester from the Sea)-- c.1925, Etching. Edition not stated. Signed in pencil. Signed in the plate, lower left. Image size 8 x 9 7/8 inches (257 x 202 mm); sheet size 10 1/16 x 11 1/4 inches (256 x 285 mm). A fine, rich impression, on cream wove paper, with full margins (5/8 to 1 3/8 inches). A pale mat line, otherwise in excellent condition. 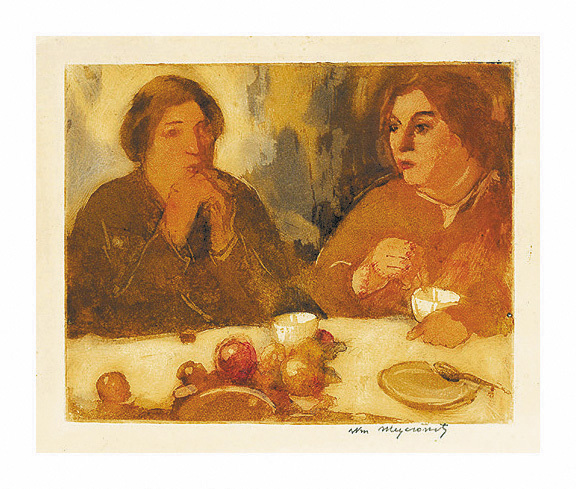 Friends-- c.1925, Color Etching and Aquatint. Edition small. Signed and titled in pencil. 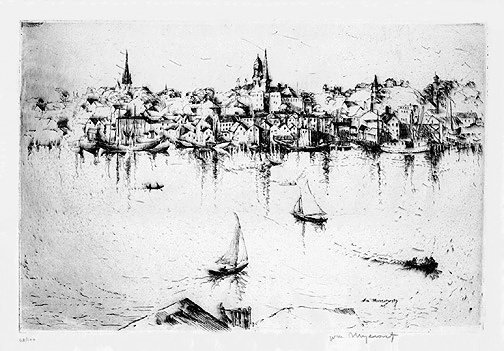 Image size 6 x 7 1/2 inches (152 x 191 mm); sheet size 7 3/4 x 9 1/4 inches (197 x 235 mm). A fine impression, with fresh colors, on cream wove paper, full margins (13/16 to 1 inch), in excellent condition. 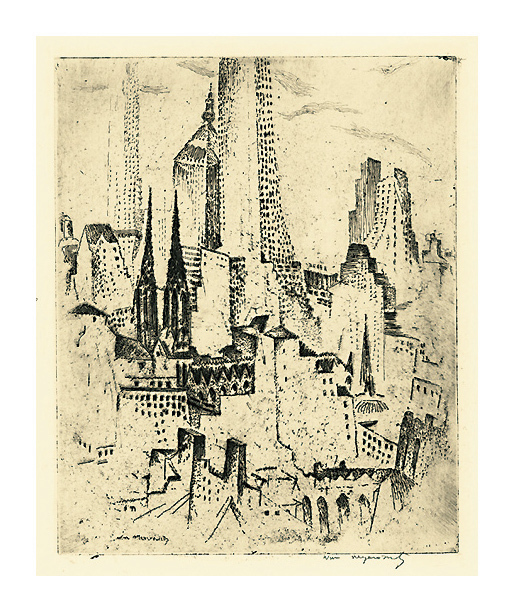 New York Interpretation-- c.1930, Etching. Edition 50. Signed and numbered 4/50 in pencil. Signed in the plate, lower left. Image size 9 15/16 x 7 7/8 inches (252 x 200 mm); sheet size 12 1/4 x 9 1/4 inches (311 x 235 mm). A fine impression, with rich burr, on cream wove paper; full margins (5/8 to 1 1/4 inches), the artist's original tack holes at the sheet edges, in excellent condition. New York No. 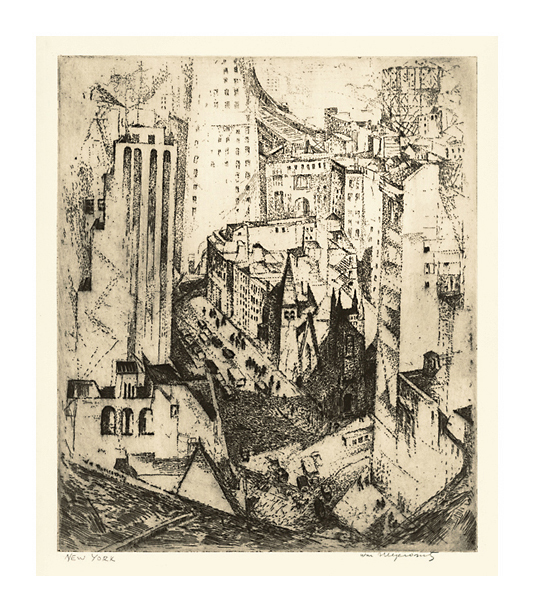 1 (Modern New York)- - c.1930, Etching. Edition c. 40. Signed in pencil. Signed in the plate, lower left. Image size 11 7/8 x 9 3/4 inches (302 x 248 mm); sheet size 13 3/4 x 12 inches (349 x 305 mm). 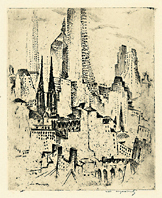 A fine impression, with rich burr and selectively wiped platetone, on cream wove paper, with full margins (5/8 to 1 inch). Hinge stains in the top left and right sheet edge, recto, well away from the image; minor skinning, in the top left and right sheet edge (from previous hinges), verso, otherwise in excellent condition.